This is US composer-pianist Haskell Small’s debut CD on Naxos. He has appeared either as composer or pianist on several other discs over the last twenty years, sometimes in both capacities together – see this review, for example. These are premiere recordings apart from Renoir’s Feast, which was released in 2006 by the unfortunately-named New York label, Museum Music (MM14), featuring Small himself on the piano. The headline work, Lullaby of War is deeply moving. In fact, it is a masterpiece. Small describes it as “both an expression of outrage at our perpetual rationalizations for making war and an offering of compassion for its victims.” It consists of six anti-war poems – two about the American Civil War, two from World War I and two modern pieces, linked together by what Small describes as a “prayer theme”. That may sound worthy but unpromising, but the poetry is very well chosen – from Stephen Crane’s War is Kind to Uri Zvi Greenberg’s Naming Souls and ending with Paula Tatarunis’s Guernica Pantoum, based on Picasso’s famous painting – and beautifully read. Those unexcited by the thought of an over-the-top Broadway-style narration need have no fear – Martin Rayner was born and brought up in England and his accent, though very slightly Americanised, remains mild, mellifluous and non-rhotic, with no affectations or irritating peccadillos – a mispronunciation of “Guernica” and the American rendition of “shone” aside! More importantly, of course, Rayner is evidently a fine actor, old-school in a good way – ‘Shakespearean’ – and has thought carefully about every phrase. Furthermore, Small’s music reflects the texts marvellously: it is intense, ironic, exhortatory, sad, militaristic and angry, and makes imaginative and poignant use of silence and resonance. The work is altogether brilliantly played by Iranian American Soheil Nasseri, who commissioned the work and gave its world premiere in 2007. The poem texts are not included in the booklet, but can be downloaded for free from the Naxos website. 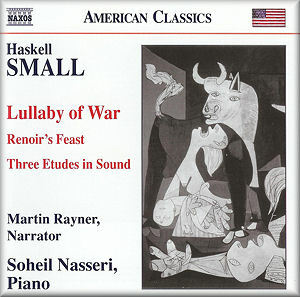 The Lullaby of War, with the piano part effortlessly performed by Small himself, can be watched in a series of four YouTube videos on the composer’s website. Narration is here shared by Rayner and a female voice, and poignant war images underline the power of Small’s music. Soheil Nasseri also gave the world premiere of Renoir’s Feast, which provides a different take on Mussorgsky’s Pictures from an Exhibition. Small has taken Pierre-Auguste Renoir’s famous painting, Le Déjeuner des Canotiers (‘Luncheon of the Boating Party’), which depicts a group of a dozen or so of Renoir’s friends relaxing on a balcony alongside the Seine, and created a kind of musical story about the scene and the characters in it, including not only the two coves in proto-muscle-vests but even Renoir as he painted it, with the individual items connected by a ‘river’ theme. As with Mussorgsky’s masterpiece, no familiarity with the painting is necessary, given that Small has invented his own characterisations for Renoir’s friends – the generally energetic, often witty piano music works just as well on its own. Small does give free rein to his imagination, and thus Renoir’s Feast is a mixture of styles, always in modern language that leans heavily towards the atonal – though not so as to render it unapproachable. Three Etudes in Sound is a considerably earlier work than the first two, but impressive nevertheless, despite its short duration. According to Small the Studies are less concerned with virtuosity and more with “color and sound control”. The section titles are illuminating in this regard: “Sound Layers”, “Sound Swirls and Spikes” and “Sound Sustained”. The Etudes are like something Stockhausen might have written if he had taken a less egotistical, more audience-friendly path! Sound quality is excellent, the CD booklet brief but informative. Amusingly, there is a small photo of Small, in black and white, whereas Rayner – looking curiously like Small’s younger brother – and Nasseri both get a big colour one. In sum, this is one of those occasional discs that really does live up to the ‘American Classics’ label.